AIRLINE WITH THE BEST BEER ON BOARD . .
We’re here to answer a few widely debated questions, starting with the following: At what moment does a vacation actually start? Is it that last minute you clock out and walk away from your desk, your long anticipated airport arrival, or the moment your plane lands at its destination? For us, the answer is simple: Vacation begins at that initial, glorious sip of the first airplane beverage. There’s no better feeling than sitting back, relaxing, and cracking open that first beer on board. This got us to thinking; of all the domestic airlines out there, which company is serving up the best beer? We got to researching and determined the winner. First, lets be clear. In order to win, the airline had to serve their great selection of beer to every passenger in every class. Often when it comes to lists and awards ranking airlines for things such as the best food, best service, or best drinks, only the premium cabin is considered. And that makes no sense, because the majority of the people on the plane are sitting in coach, and they absolutely deserve a good drink. And that’s why, when it comes to procuring a good beer, you’ll do no better than flying Virgin America. Virgin America fliers, rejoice — you have the best in-flight beer selection in the country! Alongside your standard Heineken and Bud Light, the airline serves up several craft beers on board, including Anchor Steam, 21st Amendment Sneak Attack, and 21st Amendment Brew Free or Die IPA. Customers flying in the main cabin select section, as well as first class, won’t spend a dime on their booze either, as beer, wine, and liquor are included in that (golden) ticket. 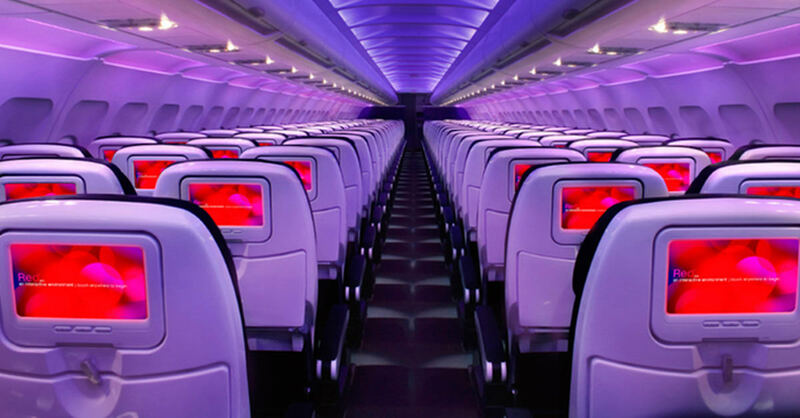 And it doesn’t stop there; Virgin America’s snack list is killer, too. Of course, your standard nut mix and chocolate chip cookies are on the list, but if you find yourself with a craving for veggie chips, sea salt popcorn, kettle chips, or jerky sausage, you’re in luck. Thank God — because who wants to drink their ice-cold beer without a salty snack on the side? And for those with a sweet tooth, Vanilla Bean Caramel Popcorn (!!) and M&Ms are also available. Can’t decide between salty and sweet? There’s a Hail Merry Salted Brownie for that. Delta comes in at No. 2, and while many others have listed this major airline as possessing the best beer list in the country, we’ve found that on multiple flights, the full selections weren’t available. In fact, on a number of trips in which a craft beer such as Sweetwater has been advertised, we’ve been told by the flight attendants that they actually rarely have it on board. For this, we felt it only fair to penalize them a spot. Jet Blue comes in third, thanks to offerings from Brooklyn Brewery and Harpoon, followed by Alaska Airlines in fourth and United in fifth.